Do you really need to bring all this stuff? Last week, BlueHour announced it’s photo tour schedule for 2018, which includes incredible new destinations, like Italy, Alaska, Arizona, and Yellowstone, and old favorites like, Oregon, the Canadian Rockies, Iceland, and Acadia. Having done these tours for a few years now, we always get a lot of questions from our travelers/students about what gear to bring on a photo tour. 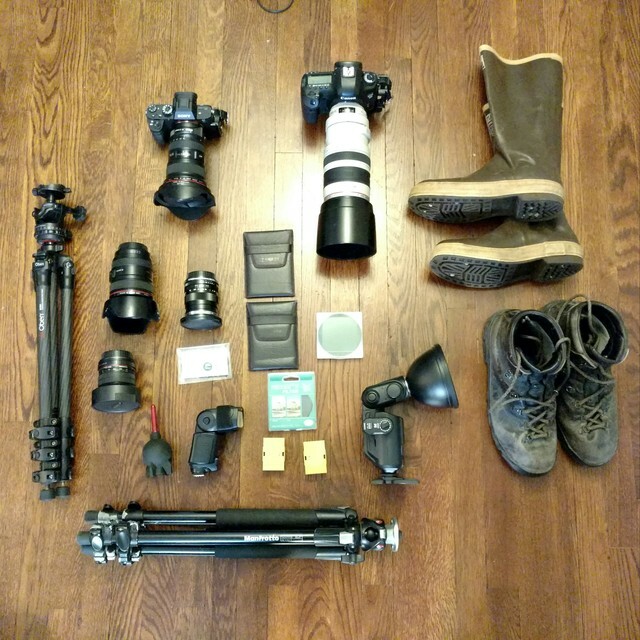 And perhaps more importantly, we have made a lot of our own observations about how much and what type of gear our travelers carry and how they carry it, and this has given me plenty of insight into how you can get the most out of a photo tour by choosing the proper combination of gear and carrying it properly. As photo-fanatics, we love our equipment for sure, and when we go to a special destination we may feel tempted to bring ALL of our best equipment and try out everything from wildlife to long exposure landscapes to macro to flash. But over the years, I’ve found that bringing everything leads to emphasizing nothing, and may result in a dilution of your creative efforts, as you spread yourself too thin across all the different pieces of equipment you brought. And of course having to carry too much gear limits your mobility and endurance, and consequently your enjoyment. For all of our tours, we’ll help you out by determining ahead of time what the strengths are of the location you’re heading to, so you can bring only the equipment that helps you capture those strengths. For instance, a 400mm telephoto lens would be in its element on a Kenyan Safari, but if you brought it to Iceland in the winter, it might sit inside your camera bag the whole time. Early on in my career, when I flew to New Zealand, I made the mistake of packing some of my camera gear, including my all-important tripod, in my luggage instead of doing the smart thing and keeping it all in my carry-on bag. My luggage ended up getting lost for the entire duration of my three-week trip, and I ended up buying not only a bunch of clothes to get me through, but a new tripod and flash bracket as well. And, camera gear costs A LOT more in most other countries than it does here in the U.S. Spending hundreds of dollars on replacement gear the instant I stepped into a new country on the other side of the world was not the best way to start a photo trip, on top of the $2,000 I spent just to get there. Lesson learned. From that point on, every piece of important gear has stayed on my back the whole trip. And knowing that it all must fit in my carry-on encourages me to downsize my kit for travel. Cradling your camera equipment in your arms or wearing it by the straps all day leads to a lot of fatigue, especially if you use heavy camera bodies and long lenses, and makes it harder to walk on uneven terrain because you won’t be balanced. Invest in a comfortable, photography-specific backpack that stores all of the gear you’re going to carry, including your tripod. As we walk around from one location to another, it’s nice to be able to pick up one pack and go, rather than bunches of loose equipment or small bags. Keeping your gear enclosed also protects it from impact and rain. A photo-specific pack has padded compartments to keep your camera and lenses from bumping into each other, has specific spots for memory cards, filters, and batteries, and most have waterproof rain covers. I highly encourage you to get a real two-strapped backpack and not a shoulder bag or sling bag if you’re going to carry more than 8 pounds of gear. A backpack distributes the weight of your equipment evenly onto both shoulders, and a good pack has a waist strap to put more of the weight on your hips (and less on your shoulders), and leads to much less soreness at the end of the day! There are seemingly infinite choices in camera packs these days, so choosing the right one can be a daunting task. My backpack of choice is the Lowepro Whistler, because of its weatherproof material, compact form, and rear-opening compartments (so the side that faces your back isn’t the side that you put down on the wet ground when you take it off). It’s actually a smaller pack than I used to carry, and it encourages me to bring less equipment, which allows me to hike further and with less fatigue. Allie prefers an F-Stop Kashmir, because it’s designed specifically for a woman’s shorter torso, distributing the weight more ergonomically on her hips. A men’s backpack puts too much of the weight on her shoulders, leading to fatigue. There are very few camera bags for women out there with thoughtful design like this! Bringing a tripod on your photo tour lets you take sharper landscape images that you’ll be proud to print when you get home, and it opens up a whole new world of shooting in low-light conditions, and making long exposure images of waterfalls, waves, and even stars! We spend a lot of time exploring these themes on our tours. One of the things I get on my students about is to avoid cheap, flimsy tripods like the plague! I’ve seen way too many cameras bite the dust due to tripods folding in a swift breeze or ocean current, and a bricked camera is a sure-fire way to ruin your photo tour experience. But carrying TOO sturdy a tripod on a destination tour has a downfall too - a really heavy tripod is one that you’ll more likely wish you’d left at home. So as always, there’s a balance. A well-built lightweight or midweight tripod appropriate for travel is made of carbon fiber or aluminum, allows you to angle each leg independently from the others (for shooting on uneven ground), and has a ball head so you can level your camera easily. Expect to spend at least $150, but likely more, if you want a tripod that is durable, lightweight, and stable enough to keep your camera safe. You know you’ve found the right tripod when you instinctively bring it with you on every trip. And the best news is a good tripod won’t go obsolete in a few years, like your camera will, so I don’t mind spending a little extra money on one. Smaller shooters like Allie prefer to carry something even lighter such as this Vanguard VEO. Despite being compact, it still has enough stability to hold a full-frame camera, lens, and filter apparatus steady for a long exposure shot. The most underrated piece of “gear” in my photo kit is a pair of tall rubber boots. I have worn the same pair of Xtratufs since the beginning of my career, and I wear them more than any other type of footwear on shoots. If you haven’t figured it out already, I believe that your overall freedom of motion, and your willingness and ability to access unique perspectives (and not just shoot from the designated tourist viewpoints) are going to do more to get you great shots than any piece of camera gear you could own. Good rubber boots allow you to get right down to the water level, or walk in shallow streams and waterfalls, even in cold climates, getting you shots you wouldn’t be able to make otherwise. If you visit a wet place like the Faroe Islands, as Allie and I did this summer, these boots will never leave your feet. A shower cap to protect your camera and lens from rain. I prefer to use a clear shower cap like the kind you can steal from hotel rooms, because you can place it over your lens and still line-up your shot in the rain. Then I quickly take off the cap to take a few shots, then put it back on the lens again. A microfiber lens cloth. This cleans the smudges and dirt off of your lenses and filters without needing chemicals. Come on one of our tours and we’ll give you a distinctive BlueHour lens cloth! An air blower bulb. This a simple device for blowing the abrasive dust off your lens and the mirror of your DSLR before you clean with your microfiber cloth. Unlike the pressurized “canned air”, you can carry this on a plane, and it won’t spit out harmful chemicals that will stick to your glass. Now that we’ve got you thinking about what to bring and what to leave at home, let’s talk about where’ll you go with us in 2018! Check out all our newly listed tours, now ready for registration.